Sergeant Carl Custarde, nicknamed “Custard” because of his insatiable love of ice cream, became Jim Daynes most trusted friend on the first day he was assigned to be his military liaison. So inspired by his friend’s heroic new identity, Custard stole down to the lab, armed with two gallons of his favorite ice cream, vanilla-chocolate-strawberry, and entered the Bio-Regenerator. 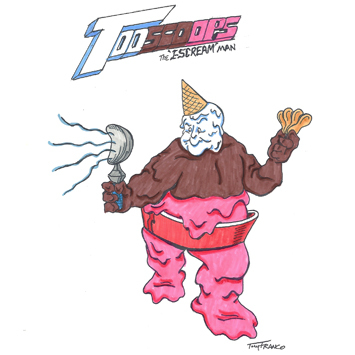 He emerged as Tooscoops, the I-Scream Man, Popstar’s new sidekick! The nuclear fission of the Bio-Regenerator intensified the cold of Tooscoops’ ice cream body enabling him to maintain his consistency under only the most extreme heat. Armed with his Cryomorphic Adaptor, an ice cream body, Tooscoops can stand proudly by Popstar’s side against any threat.